David Ortiz saluted cheering fans after the game. David Ortiz did not get much of a chance to swing the bat in Game 6 of the World Series. But he was named Most Valuable Player. The Cardinals walked Ortiz four times, three intentionally. The strategy didn’t pay off as the Red Sox clinched with a 6-1 victory and Ortiz scored two runs. Ortiz finished 11 of 16 in the Series and reached base in 19 of his 25 plate appearances. He scored seven runs in the six games. 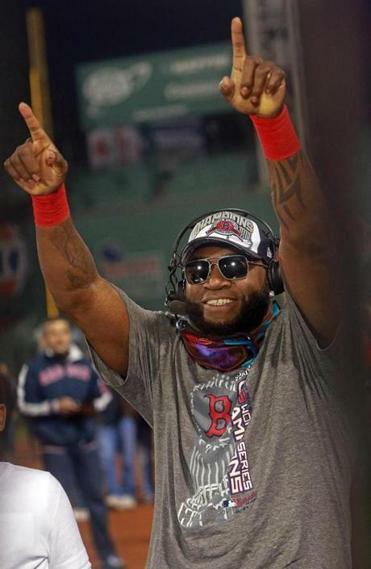 Ortiz joined Manny Ramirez (2004) and Mike Lowell (2007) as Red Sox World Series MVPs. He is now 20 of 44 (.454) in 14 career Series games. The four walks Wednesday tied a single-game Series record. “I think it might be the most special out of all the World Series that I have been part of, to be honest with you,” Ortiz said. Ortiz credited manager John Farrell with the team’s success. “A body can’t function without having a good head and our manager is outstanding. He showed to all of us since Day 1 that he was the masterpiece that we need to get to this level. Jarrod Saltalamacchia and Daniel Nava played significant roles in the Red Sox winning 97 games in the regular season and then advancing to the World Series. Saltalamacchia was one of the more productive catchers in the American League, hitting .273 with an .804 OPS. He had 40 double, drove in 65 runs and started 112 games. Nava started 108 games in the outfield, eight at first base and five as the DH. His .385 on-base percentage was second on the team to David Ortiz and he had an .831 OPS. Saltalamacchia was 6 for 32 (.188) in the postseason with one extra-base hit. Defensive mistakes earlier in the series, particularly a wayward throw that led to the obstruction call in Game 3, put him on the bench. David Ross started every game since. Nava has hit 5 of 25 in the postseason but was bumped aside by Jonny Gomes for reasons less defined. Farrell said the decisions weren’t easy. “That’s the tough thing where you see what a guy has done over the course of the year and has earned the right to be on the field,” Farrell said before the game. “Yet for specific reasons you see a matchup we might be better able to attack in a certain way. Telling two players so instrumental to the team’s success they weren’t playing is a difficult task. Farrell was the pitching coach under former Red Sox manager Terry Francona for four seasons. They talked in recent weeks about managing in the postseason. “Tito’s the one guy that I’ve gone back and forth with some things on. It hasn’t been in great detail. It’s been more from observation and maybe just some gut feel for what might be coming ahead and the urgency,” Farrell said. Shane Victorino was back in the lineup after missing two games with lower back pain. He started in right field but was dropped to sixth in the batting order for the first time this season. He went 2 for 3 with four RBIs. Farrell liked the Game 5 lineup that featured Dustin Pedroia hitting second and David Ortiz third. 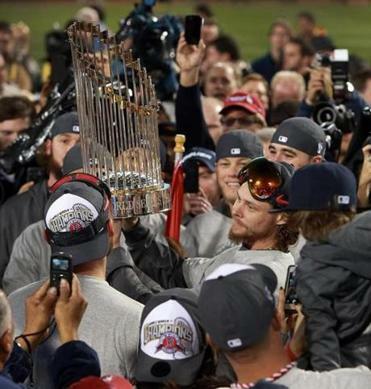 “Wanted to keep the top of the order consistent with what we had [in Game 5],” Farrell said. Batting Victorino sixth behind Mike Napoli, it also added some heft to the lineup behind Ortiz. “With Mike coming back into us at first base, obviously he’s been in the middle of the order for us the entire year,” Farrell said. “In talking with Vic [Tuesday] and the thoughts, he’s completely comfortable with it. Victorino was cleared to play in Game 5 and wanted to start. But Farrell was concerned with Victorino having to leave the game early and leaving the bench short a player in the National League park. “I feel a lot better. Progressively have gotten better every day,” Victorino said. “As we talked about, Game 5, I had every intention of being there. Wednesday was obviously not a usual game, not with a chance to win the World Series. But Farrell wasn’t planning on any sort of pregame speech or motivational tactics. Victorino reflected on winning his fourth Gold Glove, the first for playing in right field. “It means a lot. More than anything I think the magnitude of moving to right field, the magnitude of playing in Fenway Park, this was a big surprise,” he said. “I took it as a surprise about how everybody talked about how hard Fenway Park in right field was to play. I’ve always worked hard on my defense and I’ve always taken pride in my defense . . . I think there are a lot of other guys that are deserving of a Gold Glove. “I feel that much better about — again not just myself, but my team. Because it’s just not myself out there, it’s having a good center fielder, a good second baseman, a good defensive first baseman, to be able to play what they say is the most difficult right field in baseball. Pedroia won his third Gold Glove at second base, beating out Robinson Cano of the Yankees and Tampa Bay’s Ben Zobrist. Red Sox bench coach Torey Lovullo has been contacted by several teams with managerial vacancies. But he has asked all parties to wait until after the World Series to further discuss their situations. Lovullo, 48, has played a pivotal role in helping turn around the Red Sox and has nine seasons of experience managing in the minors. He was on Farrell’s staff in Toronto from 2011-12 as the first base coach before joining him in Boston. The Cubs and Tigers are two teams Lovullo has ties to. When Cubs president of baseball operations Theo Epstein was with the Red Sox, he hired Lovullo to manage Triple A Pawtucket in 2010. Lovullo was drafted by the Tigers in 1987 and was with that organization through 1990. If Lovullo leaves the Red Sox, Triple A manager Gary DiSarcina would be a candidate to join Farrell’s staff.